On Sunday, the Grand Prix ring belonged to the IHJA Medal Finalists as they rode to claim the coveted championship title in their division. Crete, IL – September 17, 2017 – The Illinois Hunter Jumper Association (IHJA) held the year-end A circuit medal finals at Balmoral Park in Crete, Illinois, this past weekend. The show also hosts the Midwest Marshall & Sterling Finals and the Zone 5 Championships but on Sunday, the Grand Prix ring belonged to the IHJA Medal Finalists as they rode to claim the coveted championship title in their division. 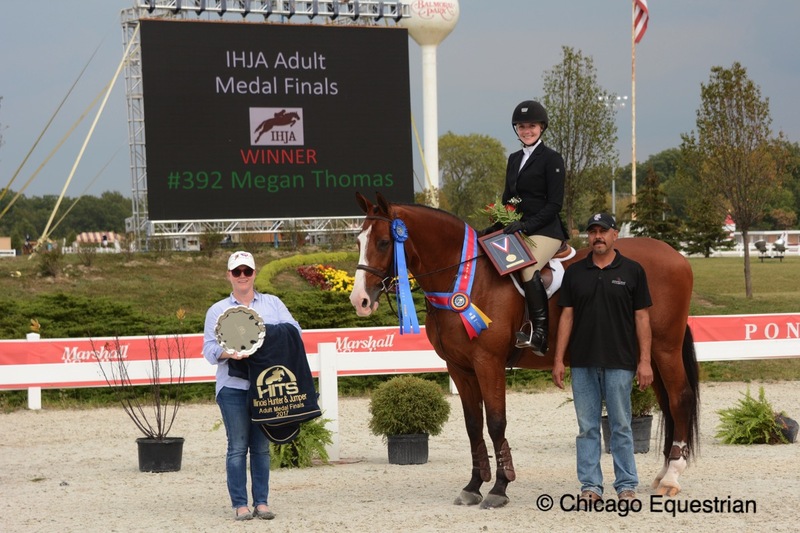 Riders received framed medals along with a custom IHJA Finals jacket from Mona's Monogramming. The big event of the day was the IHJA Junior Medal Finals with a course designed by Patrick Boyle to get riders ready for the Maclay Regional Championships, which take place Saturday, September 23rd in Lexington, Kentucky. Paige Matthies and Aristea Santoro took the top honors in the IHJA Junior Medal Finals pictured with their Northern Pines Team. After a 16 jump course for round one, which included a snake jump, a chute and a rounded hay bale jump, the top 5 riders worked off to impress judge Steve Wall of Santa Barbara, California. Riders Britta Stoeckel with a first round score of 80, Celia Bresch (81), Gia Rinaldi (85), Aristea Santoro (86) and Paige Matthies with the top score of 88, returned for the testing phase. It was Paige Matthies of Lake Leelanau, Michigan, aboard Don Stewart’s Blurred Lines who rode to the top of the leader board after both rounds. Matthies rides with trainer Melissa Hirt at Northern Pines Farm in Maple City, Michigan. Hirt’s team also landed the reserve championship with Aristea Santoro, 14, Cedar, Michigan, on Icaris Vede owned by Ashland Farm. Both riders head to the Maclay Regionals next week. “This is only my second year going to regionals so I’m pretty nervous but my ride today definitely gave me confidence for the regionals,” said Santoro. Both girls credited their success in the ring to their dedicated families, supportive friends and especially the great team at Northern Pines Farm. IHJA Children's Medal winner Lauren George with trainer Sirena Liggett. 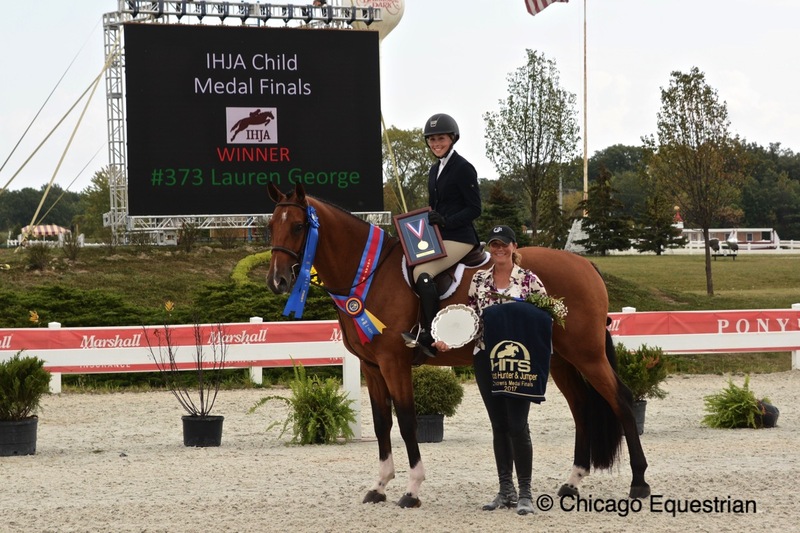 Lauren George and King’s Landing rode to the top honors in the competitive IHJA Children’s Medal Finals with Hayley Anderson, 14, and Bombardier earning the reserve championship. Anderson has ridden with Kim Gardiner and Mara Kranz-Olseng at Perfecta Farm in Streamwood, Illinois, for about two years. Her mount, Bombardier, is 20 years old and a veteran at the local medal finals. This is Anderson’s last year with him as she plans to move on to the 3’ and 3’6” divisions next year. IHJA Adult Medal winner Megan Thomas with trainer Sara Rhodes. In the IHJA Adult Medal Finals, Megan Thomas and Capri donned the tri-color ribbons with Rachel Turk and Cleverboy 4 taking the reserve championship. 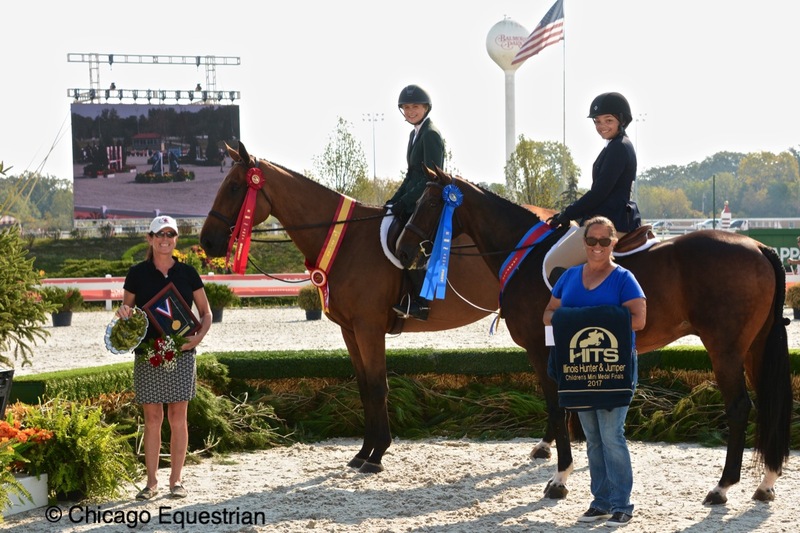 Ellen Schmidt accepts her award for the IHJA Pony Medal Championship with trainers Melissa Hirt and Gabriel Rodrigues. 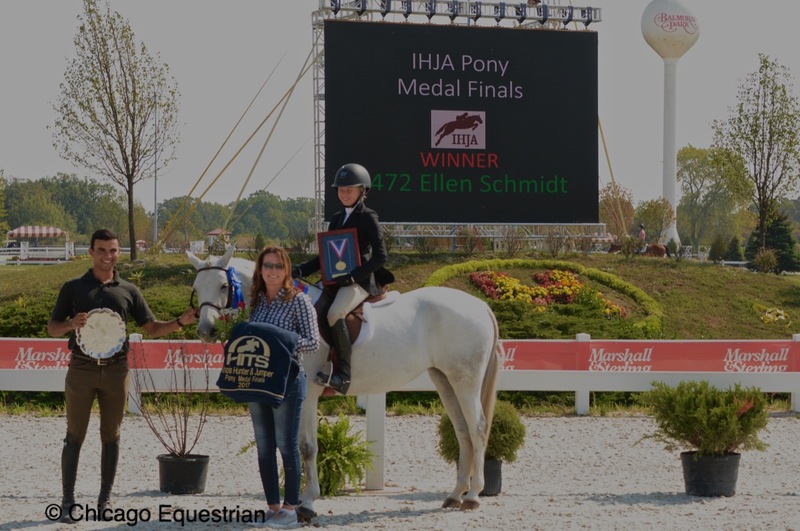 Ellen Schmidt, 10, earned the IHJA Pony Medal Championship aboard Illumination. Schmidt rides with trainer Melissa Hirt and Gabriel Rodrigues at Northern Pines and has made the drive from Grand Rapids, Michigan, for about 2 years now. Schmidt started in the Children’s Pony division then moved into the Green Pony division, earning several championships at the Winter Equestrian Festival. Schmidt and the Northern Pines team look forward to moving into the jumpers and equitation next year. Emma Lackey and Peppermint Twist riding for HBG Equine, took home the Reserve Championship. IHJA Children's Mini Medal winners Sydney Joiner (1st) and Madison Smith (2nd) with Judgement Farm trainers Tina Judge-Boyle and Lori Hollands. Judgement Farm riders took the top two spots in IHJA Children’s Mini Medal Finals. Sydney Joiner, 12, of Naperville, Illinois, topped the list after the work off with Madison Smith, 16, also of Naperville, taking second. Joiner has ridden with Judgement Farm for four years and showed her Dutch Warmblood, Ravello, who is 18 years old. Joiner claims he is the sweetest horse and wants to lick everything in his reach. Joiner usually shows in the novice and modified hunters and looks forward to moving up to the 3’ next year. Smith’s horse, Legato, is only 5 years old and 17.3 hands. They bought him as a 3 year old and this was his second show ever. Smith showed in the qualifier earlier in the week in order to compete in the finals. Smith plans to continue to bring him along and to show a little next year as well. 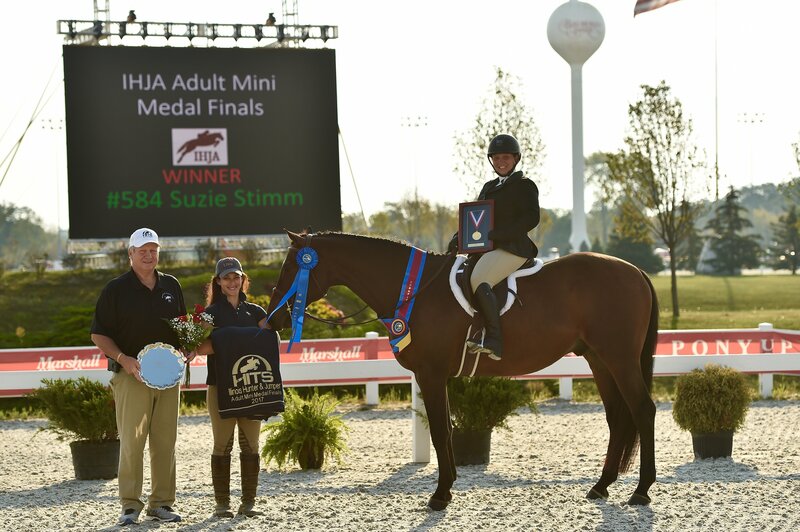 IHJA Adult Mini Medal winner Suzie Stimm with trainer Aly Senatore and show manager Pat Boyle. IHJA Adult Mini-Medal riders took their turn to tour around the grand prix ring for their championship. 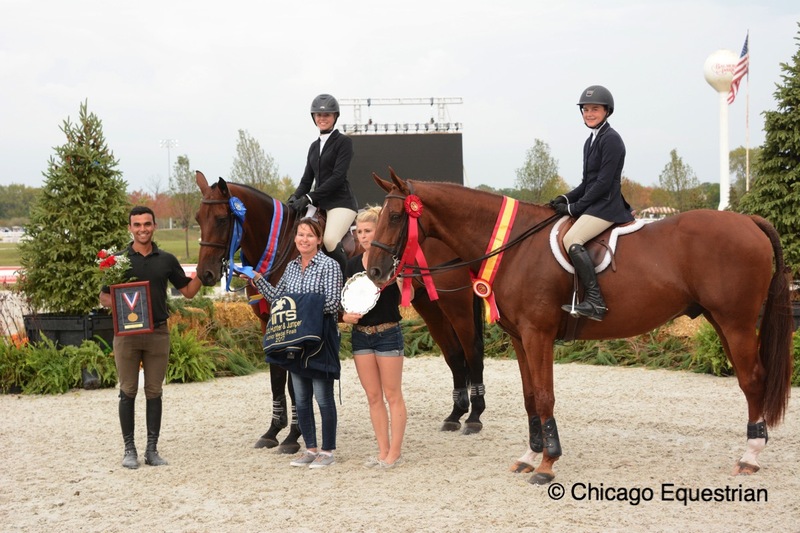 Suzie Stimm, Vernon Hills, Illinois, aboard Memorable took the first championship title of the day. Picking up the Reserve Championship was Felice Hybert, Crete, Illinois, and High Honors. Hybert also rides at Judgement Farm in Oswego, Illinois. Hybert and Stimm are friendly competitors and she remembers back to 2015 when she won the finals and Stimm was second, yet they cheer each other on to this day. This was Hybert’s first show in a year and only qualified for the finals in the final qualifying class. Her 14-year-old thoroughbred is registered by the Jockey Club and Hybert says he has a heart of gold and will do anything for her. Hybert joked that sometimes she thinks he even learns the course for her! Riders and trainers will celebrate the end of the show season at the IHJA Awards Gala November 18th at the Renaissance Hotel and Conference Center in Schaumburg, Illinois. Trainer Liz Atkins' training program is designed around developing and challenging both horse and rider to achieve success at any level. She especially likes to bring along young, green horses to the upper levels of show jumping. 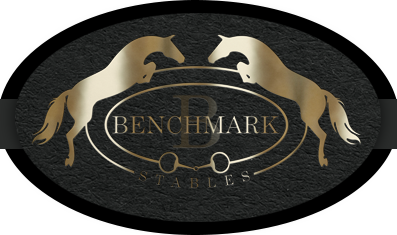 For more information visit her website at www.benchmarkstables.com.